The weather is warming up in Los Angeles and something about all the sunshine makes me crave spicy food! 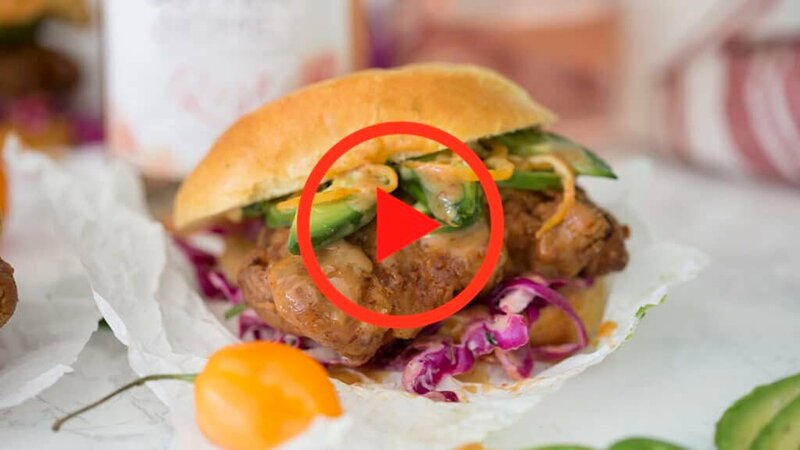 I paired a crispy buttermilk fired chicken with a perfectly creamy, tangy slaw and sweet and SPICY habañero honey mustard sauce. All of this came together with a bit of avocado, because California, and a rich brioche bun. 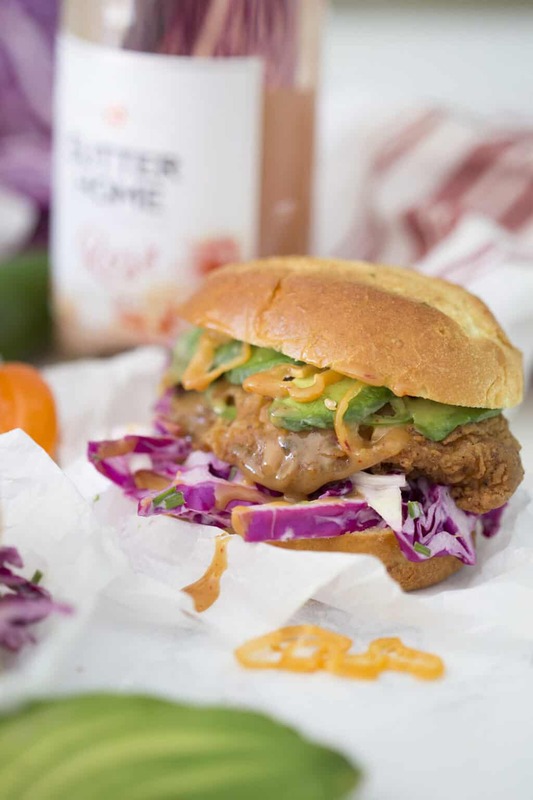 What could be better than crispy, right out of the fryer, fried chicken creamy avocado, crunchy slaw and a great sauce? All of that with a glass of wine! 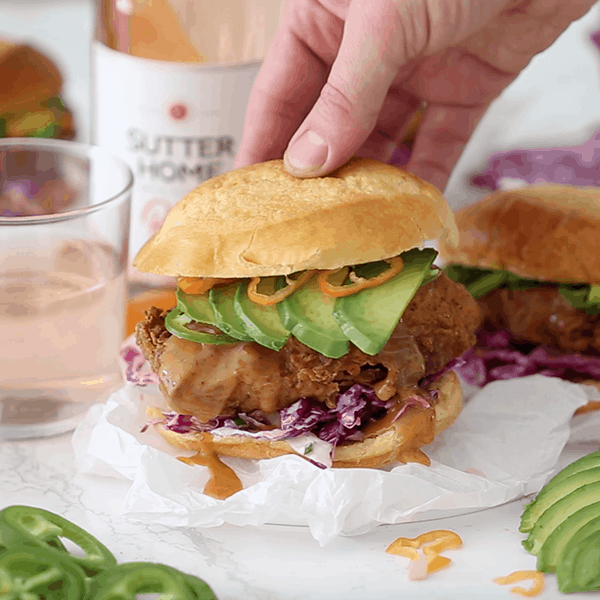 I partnered with Sutter Home for their Sweet on Spice campaign and made my warm-weather dream sandwich, which paired beautifully with a dry, but slightly sweet, brand new Sutter Home Rosé. Who doesn’t love a kiss of strawberry?? Now I loved this sandwich and you can always pair the spice down to suit your palette but if you are completely adverse to anything with some heat then you at least have to make this coleslaw!! It’s creamy, with just the right amount of tang and so easy! I nibbled on it so much the day this was made that I worried there wouldn’t be enough to shoot! You could say the avocados are the official fruit of California. We grow about 90% of the domestic output, and just by the by, the average American enjoys 7 pounds of them per year! I love the addition of avocado in this recipe because the creaminess really balanced out the spice of the cayenne and habanero peppers. 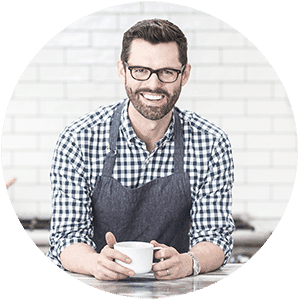 Wash and trim any fat or unwanted pieces off of each chicken breast. One chicken breast should be big enough for two sandwiches. Add chili powder, garlic powder, salt, white pepper, paprika and cumin to a medium bowl. Give it a quick whisk. Dip each chicken piece into the rub. Move it around so that the chicken is evenly covered. In a large bowl, pour buttermilk and add chicken to marinate. Cover the bowl with plastic and transfer to the refrigerator for about 2 hours or even overnight. This step will ensure that the chicken is super moist! In a large bowl, combine flour, paprika, salt, garlic, ground pepper and cayenne pepper. Give it a whisk. Heat a pot of vegetable oil to 350F over medium high heat. Roll out a paper towel station. Coat each piece of chicken in the flour batter mixture. Add up to 4 pieces to the pot to fry. Cook for about 6 minutes. Transfer to the paper towels to cool. 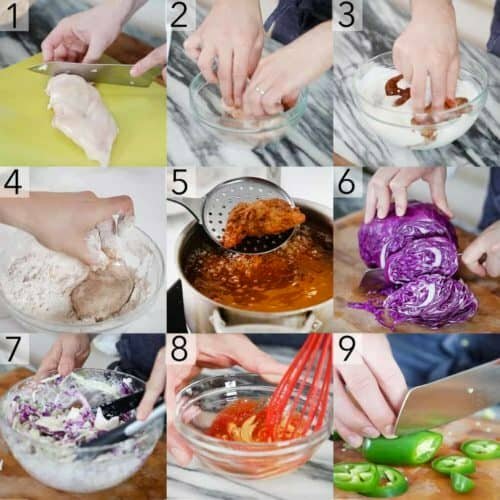 Chop up about ⅓ of the purple cabbage and ⅓ of the regular cabbage. In a medium large bowl, add sour cream, ranch, caraway seeds, salt, sugar, lemon zest from ½ a lemon, green onions and chives. Add lemon juice and a splash of white wine vinegar. Give it a whisk. Add in the cabbage slaw. Toss with tongs. In a small bowl, add honey mustard, honey and hot sauce. Whisk until combined. Chop the peppers into thin slices. Slice the avocados. Add coleslaw, chicken, spicy sauce, pepper and avocados to each brioche bun. Serve with a glass of Sutter Home Rosé. Place the coleslaw and chicken on the toasted brioche bun. Drizzle the habañero honey mustard sauce on. Add a fan of avocado slices. A delicious sandwich featuring crispy buttermilk fried chicken, a habañero honey mustard sauce and the best coleslaw ever!!! Add chili powder, garlic powder, salt, white pepper, paprika and cumin to a medium bowl. Give it a quick whisk. Dip each chicken piece into the rub. Move it around so that the chicken is evenly covered. In a large bowl, pour buttermilk and add chicken to marinate. Cover the bowl with plastic and transfer to the refrigerator for about 2 hours or even overnight. This step will ensure that the chicken is super moist! In a large bowl, combine flour, paprika, salt, garlic, ground pepper and cayenne pepper. Give it a whisk. Heat a pot of vegetable oil to 350F over medium high heat. Roll out a paper towel station. Coat each piece of chicken in the flour batter mixture. Add up to 4 pieces to the pot to fry. Transfer to the paper towels to cool. Chop up about ⅓ of the purple cabbage and ⅓ of the regular cabbage. In a medium large bowl, add sour cream, ranch, caraway seeds, salt, sugar, lemon zest from ½ a lemon, green onions and chives. Add lemon juice and a splash of white wine vinegar. Give it a whisk. Chop the peppers into thin slices. Slice the avocados. 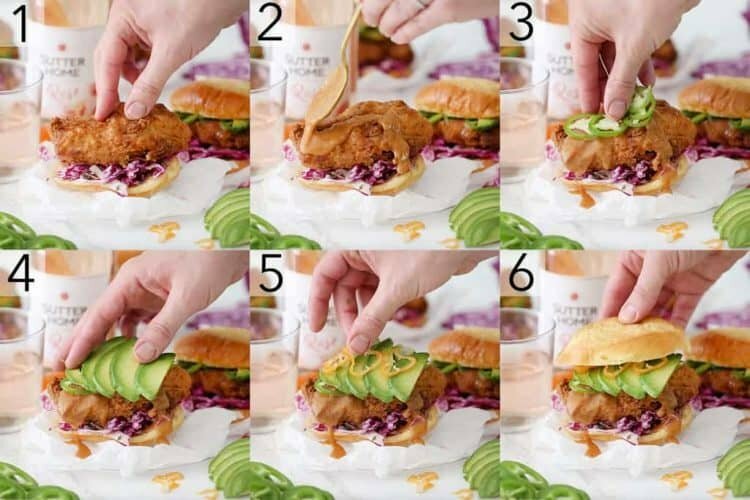 Add coleslaw, chicken, spicy sauce, pepper and avocados to each brioche bun. 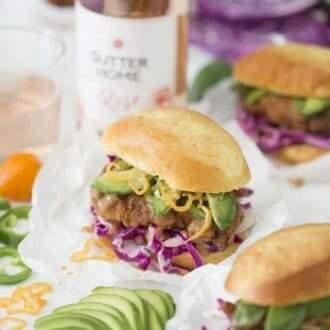 Serve with a glass of Sutter Home Rose. Made this ant it was delicious! Left off the habaneros since I didn’t want that much spice.